Sagar media inc: Indonesian officials say the tsunami could have been triggered by undersea landslides after the Anak Krakatau volcano erupted, latest reports said at least 222 people are killed after a tsunami hits the shores around Indonesia’s Sunda Strait and more than 800 people are injured and hundreds of buildings are damaged. There are fears that the death toll will rise further as emergency teams reach the hardest-hit areas. The death toll from the tsunami around Indonesia’s Sunda Strait is likely to rise even further, the country’s national disaster agency spokesman Sutopo Purwo Nugroho says.The latest official update says 222 people have been killed. 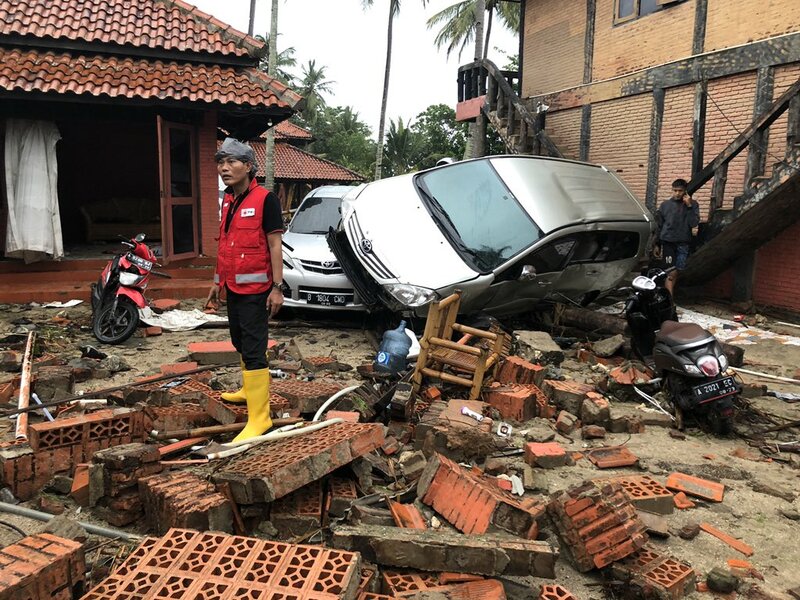 Hundreds of buildings were destroyed by the wave, which hit the coast of southern Sumatra and the western tip of Java about 9:30 pm (1430 GMT) following the eruption of a volcano known as the “child” of the legendary Krakatoa, national disaster agency spokesman Sutopo Purwo Nugroho said. Search and rescue teams were scouring rubble for survivors, with 222 confirmed dead, 745 people injured and 30 reported missing across three regions, he said. “This number is predicted to increase because not all victims have been successfully evacuated, not all health centres have reported victims and not all locations have got complete data,” Mr Nugroho says. Three tourists died at this beachfront hotel,rescue operation are by the agencies. Indonesia’s Disaster Agency: We based our information from the meteorological agency. If they said no tsunami, we announced no tsunami. When they said it was a high tide, we said it was a high tide. They revised to tsunami, so we issued a press release saying it was a tsunami. Further reports by Indonesian authorities say 168 people have been confirmed dead in the tsunami that hit coastal areas of Java and Sumatra regions on Sat night. Popular band Seventeen was performing when dais collapsed one band member missing. Anak Krakatau is a small volcanic island that emerged half a century after Krakatoa’s 1883 eruption, which killed over 36,000 people. Indonesia’s geological agency said that Anak Krakatau had been showing signs of heightened activity for days, spewing plumes of ash thousands of meters into the air. “Normally, a tsunami is preceded by large tectonic earthquakes. But the problem is that the tsunami in Banten and Lampung was not caused by an earthquake this time. However, the information from the geological agency reveals that there have been tremors around Mount Anak Krakatau since June,” Muhamad Sadly from Indonesia’s disaster management agency, BMKG, told media. The victims were mainly in the areas of Padenglang Regency, South Lampung and Serang, all less than 150 kilometers (93 miles) west of Jakarta.